The 2010 Subaru Legacy is wider, taller and longer than the previous generation but still offers the same good ol' fashioned boxer engine and symmetrical AWD. For those of you who think this new Subaru looks familiar, it's because it looks almost identical to the Subaru Legacy Concept minus the LED-lights, shiny metallic paint and too-small mirrors. The new legacy comes in three trim levels: Legacy 2.5i, Legacy 2.5GT, and Legacy 3.6R. The Legacy 2.5i is the base model and equipped with a 170 HP 2.5-liter fourbanger equipped with either a 6-speed manual or lineartronic CVT. 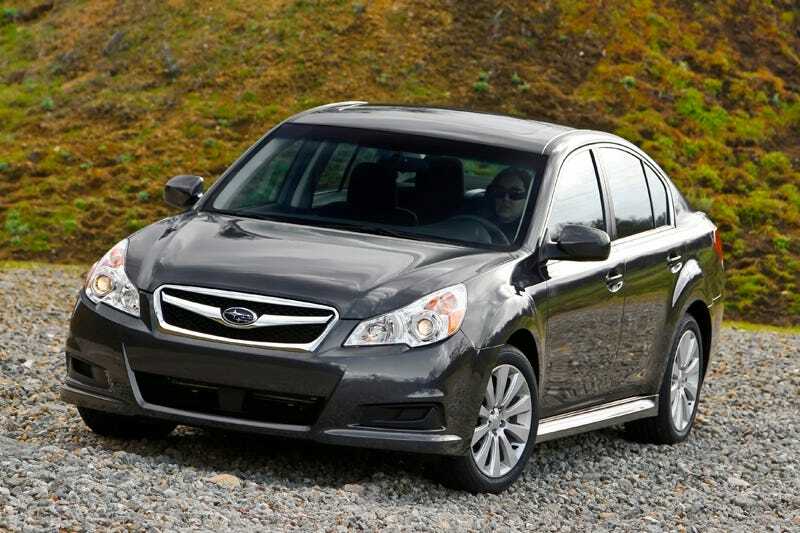 The turbocharged Legacy 2.5GT gets a 15 HP boost to 265 HP and comes only with a 6-speed manual, making it our choice. Though the six-powered Legacy 3.6R gets a slight increase in power to 256 HP to accompany the increase in displacement from the previous 3.0-liter six-cylinder engine, it still remains less powerful than the 2.5GT and is only available with a 5-speed automatic. So far, Subaru has only revealed information about the Subaru Legacy sedan, which is debuting at the New York Auto Show, meaning we'll have to wait for another auto show to see the wagon. International Auto Show (press days on April 8 and 9, open to the public from April 10 through 19). The new sedan will be introduced in the U.S. market as the 2010 Legacy. midsize sedans in the North American market that are built around comfort and space. expanded by 80 mm, allowing for additional rear legroom. styling, combining boldness and beautility into its sporty look. vigor of the new Legacy. AWD system, enhancing the presence of the Legacy. capacious and framed by the combination lights. • Moldings around the windows accentuate the sleek design of cabin area with a quality feel. and in the decorative hairline finish on the surfaces of the console. 4-way power front passenger seat are available on premium-grade models. automatic transmissions and Lineartronic™ CVT. information display with average-MPG indicator is located in the center of the dashboard. economy. Three engine types are available in the U.S. market. of its catalyst, the engine offers outstanding exhaust gas control. • Design changes in the turbocharger have raised performance and lowered emission levels. center gravity, which results in more efficient weight distribution. engine is compact and lightweight. grade fuel. The 3.0-liter engine required premium grade. world's first* longitudinally mounted CVT system for AWD production vehicles. operating in its most efficient range. provides smooth acceleration with a linear feeling in response to the accelerator pedal. • Fuel economy is improved through the reduction of friction and weight in the AT unit. stability but also improves front impact safety. turbocharger to be placed under the engine, which also helps reduce emissions. stroke in line and improves ride comfort. enhancements have significantly lowered overall noise levels. control is offered by Subaru's Brake Assist safety system, which is available on all models. keeping the body dimensions and weight virtually unchanged from the previous model. • The hood and trunk lid are fitted with gas springs for greater ease of operation. panels to afford another level of protection to the vehicle's occupants. airbags are enlarged to further enhance passenger protection. enhanced protection against whiplash injury in a rear-end collision. • A 60/40 split fold-down rear seat creates a wider passage to the truck compartment. • A cup holder inside the rear seat armrest comes standard. Harman-Kardon® audio system and a power moonroof with a tilt-up and slide mechanism.